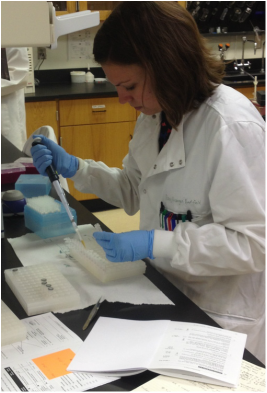 When asked what Stacy spends her time in the lab doing, her response was "PCR! PCR! PCR!" Stacy spends hours in the lab running PCR (Polymarase chain reactions) as well as DNA sequencing for Gracilaria seaweeds. PCR is a a method for creating multiple copies of a specific piece of DNA in a test tube. It is used in the lab for identifying genetic fingerprints (individual genes), which can distinguish between individuals of the same species using only their DNA. Stacey has used this method to identify the difference between male and female Gracilaria seaweeds. Stacy injecting seaweed DNA into test tubes with a tool called a pipette!